Evernote is a great tool for taking notes, clipping web pages, and saving other scraps of data you need to keep tabs on. But some people may not like its linear nature, where everything is clipped into notes contained in notebooks. A web app called CardDesk (currently in beta) aims to change that. CardDesk is a digital corkboard that lets you organize your Evernote content as old-school index cards. 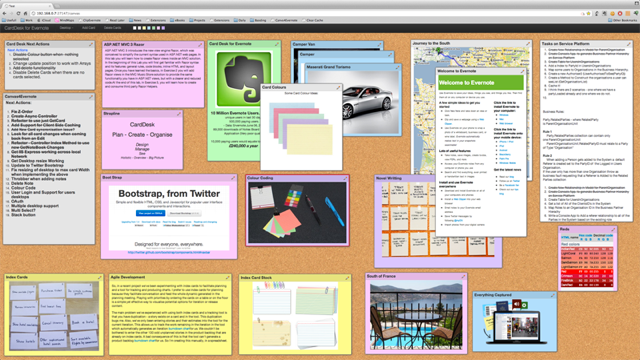 CardDesk allows you to organize Evernote data as index cards on a corkboard. You can arrange the index cards any way you want with color coding, stacking into groups, and resizing. CardDesk also offers multiple desktops so you can sort large groups of notes by topic or keyword. To get started you can either visit the CardDesk website or install the Chrome App and access it from there. Before you start using CardDesk you have to sign-up for an account and then you must authorize the app to access your Evernote content. Once that's done, you're ready to go. All your notes are contained in a pop-out drawer on the left side of the screen. If you don't see the drawer move your mouse in that direction to reveal it. Adding notes to your desktop is just a simple drag-and-drop. The app instantly displays your content as an index card. Drop as many notes in as you like and then arrange them in whatever order you need. CardDesk's menu is basic but useful. At the top of CardDesk window you'll see all the menu options the app provides to manipulate your cards. To color code a note, for example, click on the card and then click on one of the color choices at the top of the CardDesk window. The menu is also where you can add desktops, create a new card that automatically turns into a new Evernote note, or zoom in and out of the desktop. If you need to edit the content of a card just click the elephant icon in the upper right corner of the card. This will open a new window inside Evernote that allows you to edit your note. CardDesk is still in its early days and doesn't have a ton of features, but it's a useful tool for anyone that wants to work with a large group of notes more easily.